If there was ever a website that summed up the phrase “all mouth and no trousers” it is probably Vegas Hero. A Genesis Global Limited site (making it a sibling to excellent sites including Casino Cruise and Spinit) that hit the market with all the brash confidence in the world, Vegas Hero certainly presents itself as another top-quality site from this operator, but as soon as you start to scratch at the surface, you realise there is very little beneath it. Everything that Vegas Hero has going for it is thrown in your face immediately, from the games collection, to the promotion, to the concept, and they’re all impressive enough, but after a while you realise there’s nothing else, what you’re given from the outset is all you’re given, there are no hidden depths to discover. As the name suggests, this is an online casino that has opted for a superhero based theme. However, instead of spending money on image rights to famous superheroes, or even on designers to create their own, Vegas Hero instead attempts to be clever, and it doesn’t do a bad job of it. The banner shows a suited, professional looking man in full superhero pose in front of a collection of basically every famous Vegas landmark. While this is a bit on the nose, it’s pretty effective, and gets players excited for what else the site has to offer in terms of design. Unfortunately, the answer is nothing, once you get past the banner, you’re met with a white background, and a basic design, with nothing to make the site stand out whatsoever. 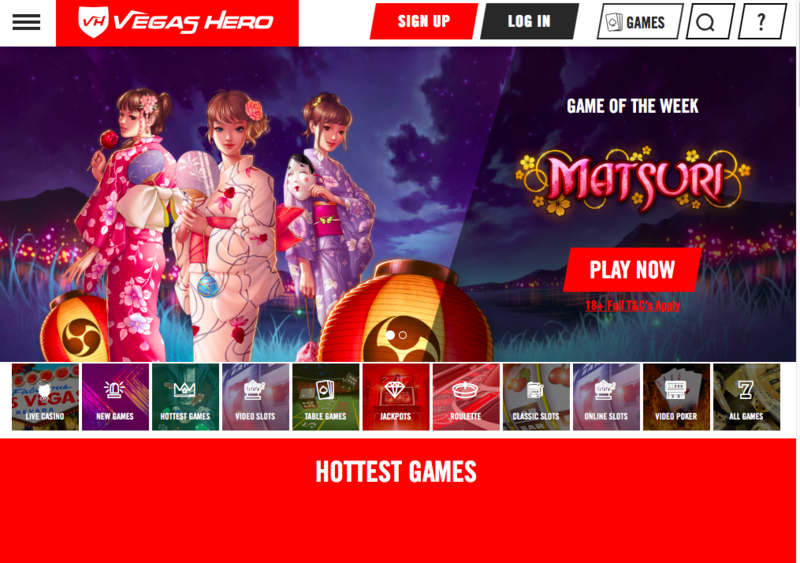 The iGaming world is more competitive than it ever has been, and one nice touch simply doesn’t cut it anymore (if it ever did) but that doesn’t seem to stop sites like Vegas Hero doing the absolute minimum and assuming that’ll be enough. Navigation is easy enough, everything is simple to find, and numerous thumbnails allow quick access to games, but we expect that by now, players need more, and they don’t get it here. Vegas Hero is very proud of the 1,000 plus games it has in its collection, and rightfully know, there’s no doubting that’s a good number, and one that makes this online casino genuinely competitive. However, this games come from a surprisingly small number of developers, and a list that suggests, again, that Vegas Hero is making minimum effort. 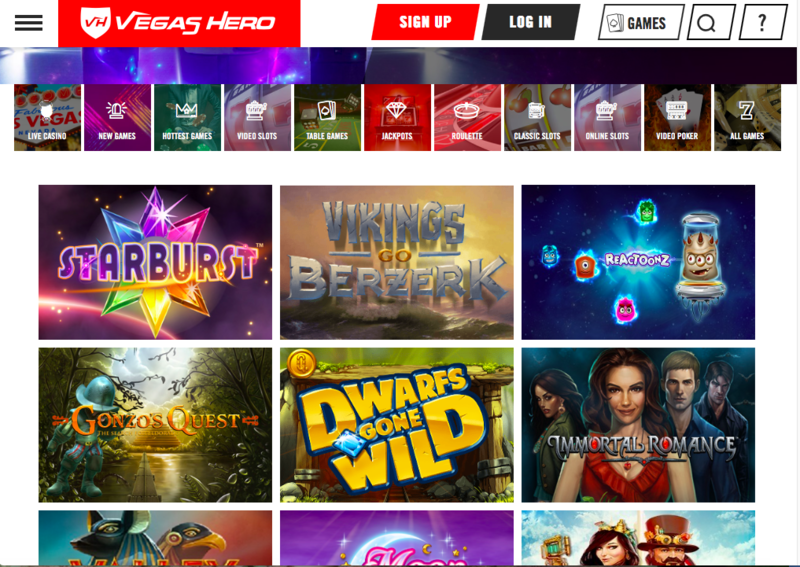 With titles coming from Evolution, Microgaming, NetEnt, Play'n GO, Quickspin, SG Digital, and Yggdrasil, it’s clear that Vegas Hero have gone for the giants of the industry (with a couple missing) and just stopped there. Rising starts like Red Tiger Gaming don’t get a look in, and the likes of Playtech are missing too, meaning that while there are many games to choose from, there’s no guarantee that your favourites will be among them. Having over 1,000 games is, undoubtedly, a selling point in itself, but it isn’t enough, similarly to the design, a good start isn’t followed up on, and it leaves one feeling somewhat flat. If you are looking for a new online casino to play at, Vegas Hero may initially seem like a good option, but that is likely to fall apart quickly.